There is one thing I think realism is definitely not, though it is often confused with it, and that is a technique. Technique is a skill you can learn so you don’t have to respond to what you are looking at, you don’t have to be inquisitive about it. If something is real to you, the question becomes, not How do I do that, but What is this phenomenon I’m perceiving? Rackstraw Downes, Paintings and Drawings, opens the season at Betty Cuningham Gallery on Wednesday, September 5th. The artist will be present for an opening reception on Wednesday, September 5th, 6 – 8PM. This will be Downes first solo show since 2014. His steadfast commitment to painting from observation, on site from start to finish, remains tantamount. Among the 11 paintings on view are three interiors of the artist’s living/studio space: two looking to the west (one painted standing, one sitting) and a third looking to the east - every chair, book, light, etc. considered anew, part of a familiar environment seen freshly. 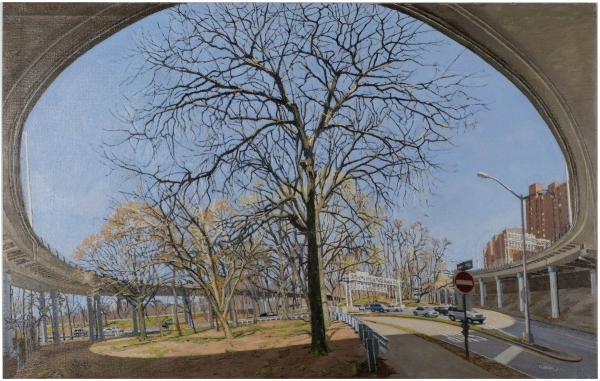 The site of three other paintings is an intersection near Columbia Presbyterian Hospital; here Downes turns the ordinary into the extraordinary observing each angle, far, near, north, and south. In an atypical vertical painting, Outdoor Passageway at 15 Rivington, Downes reveals and reveres all, from weeds to A/C units, from ground to sky. In contrast, two Texas paintings are characteristically horizontal (a demand of our West) where the richness of each creosote bush or each power line is delivered with reverence. A study accompanies each of the two Texas paintings, while one or more related drawings hang alongside each of the other nine paintings. For Downes, drawings and studies are means to know the site – very much like “successive meetings with a person; you keep discovering more”. On Saturday, September 22, 4 – 6PM to celebrate Rackstraw Downes and this exhibition, Rackstraw Downes: a painter, a 40 minute film by Rima Yamazaki will be previewed. 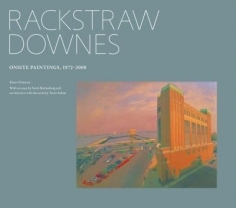 Copies of Rackstraw Downes’ Nature and Art are Physical: Writings on Art, 1967-2008, published in 2014 by Richard Milazzo of Edgewise Press, will also be available for the artist to sign. 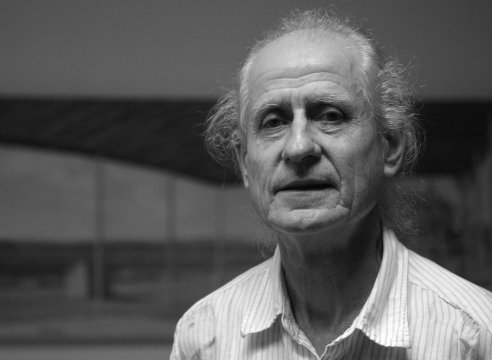 A conversation with Rima, Richard and Rackstraw will follow the film. The current exhibition is accompanied by a fully illustrated catalogue and will remain on view through October 14, 2018. Downes’s meticulous restraint and Morley’s stylistic compulsions blazed new trails for painting.